That’s why it’s imperative for your sales team to focus their time on the activities that matter to closing deals. But every organization is different, and that means the set of activities that lead to sales will be unique to each team. What’s a sales leader to do? No worries, we’ve got your back. To figure out what activities impact your number of sales wins, bring your team together to conduct an analysis of what worked and what didn’t in your most recent deals won and lost. Arrange a meeting with your reps to hold a sales win/loss analysis session. Tell them to come with information on the last few deals they won and the last few deals they’ve lost (ideally, three of each). For the lost deals, focus on the companies that made it to the later stages of the sales process, such as contracting or negotiating. Especially for younger companies still figuring out their lead flow, it’s more important to focus on where things went wrong further down the line. With both analyses, try to consider your sales process from the customer’s point of view (i.e. think about how your customer buys). Where did this lead come from? What made you look into them? How did you reach out? How did your first conversation go? What was the customer going through at the time? What problems were they trying to solve? What were they thinking about? What did they talk to you about? Were they looking at competitors? Finally, ask the higher level questions to understand what turned this deal into a success. What did the prospect say in the first couple of calls that told you this deal was good to pursue? How did you present your value proposition and use case? Who got involved in the buying process on the customer’s end to make the final decision? This is as, if not more, important as your win analysis. Keep in mind that it can be unnerving for reps to talk about deals they lost, and they probably won’t be comfortable doing it the first few times. Set the stage for your loss analysis by explaining that this isn’t to highlight what reps did wrong; it’s merely a learning process. Yes, the deal was lost — but that’s yesterday’s news. The best way to move forward is to discover what went wrong and how to fix it in the future. At what stage did this deal start to go south? Looking back now, what would you have done differently? What signal did you get that you wish you would have listened to? How could you have anticipated the deal was going south sooner? What else could you have done, or what could you have done differently, to win this deal? If you could change anything today about the way you managed that process, what would you have done? What can you and your peers learn from this? Answers could be across the board — from reps admitting they didn’t qualify leads well enough in the beginning to not validating a prospect’s interest level in actually purchasing soon. Once you’ve heard these answers from each sales rep, you’ll notice more trends in terms of what’s preventing deals from being won. Again, take notes. Identify where reps are seeing similar issues (i.e. are reps targeting companies that don’t have a real need for your product? are they not communicating the value of your service effectively?). Finally, take everything you’ve learned about what works in your win analysis and what doesn’t work from your loss analysis and apply it to your sales process. Did you learn that reps didn’t connect with the right people in organizations to make the purchasing decisions? You could add “VP-Level Conversations” as a step that reps need to complete within the sales process (and then measure it with KPIs, of course). Do this with each of your takeaways, and then continue to coach your reps around the behaviors that you’ve learned lead to closed deals for your team. 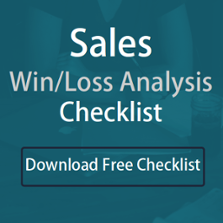 We made an easy-to-use checklist for you of the most important questions in your sales win/loss analysis. Those who do not learn from history are doomer to repeat it. That's why you should conduct a sales win/loss analysis of your closed deals.